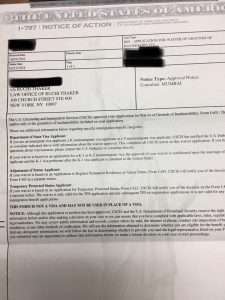 Crimmigration > I-601 Criminal History Waiver Granted at Consulate! Very happy to receive an extreme hardship waiver approval notice for a deserving client! This was a hard fought case that took over a year and a half of fighting with US CIS with multiple notices for more evidence! My client had two old criminal convictions for theft offenses and the client previously abandoned lawful permanent resident status. The Client wanted to return to the United States after many years abroad, and the Client’s United States citizen daughter petitioned for the Client, and the visa petition was approved. We then consular processed, knowing that the Client would require a fraud waiver (I-601) after being refused the immigrant visa. We filed the waiver. In adjudicating the waiver favorably, USCIS refused to admit it was wrong in requiring my Client to show certain things that the Client was simply not required to show. My last response to the request for evidence was submitted in early March 2018, under a strongly worded cover letter, pointing out to USCIS its errors. Within two weeks, we received an approval notice! So happy that my client will finally be reunited with her family here in the USA soon! Posted in Crimmigration, DHS, I-601, Immigrant Visa, USCIS, Waivers.